The House of Wisdom (Arabic: Bayt al-Hikma) was a library and translation institute in Abbassid-era Baghdad, Iraq. 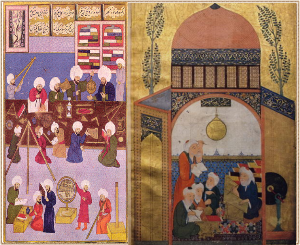 It is considered to have been a major intellectual center of the Islamic Golden Age. The House of Wisdom acted as a society founded by Abbasid caliphs Harun al-Rashid and his son al-Ma'mun who reigned from 813-833 CE. Based in Baghdad from the 9th to 13th centuries, many of the most learned Muslim scholars were part of this excellent research and educational institute. In the reign of al-Ma'mun, observatories were set up, and The House was an unrivalled centre for the study of humanities and for sciences, including mathematics, astronomy, medicine, chemistry, zoology and geography.